It was a busy and exciting weekend for us. Gina Javurek, former REGI UWSP intern and employee was married to Kyle Smith. 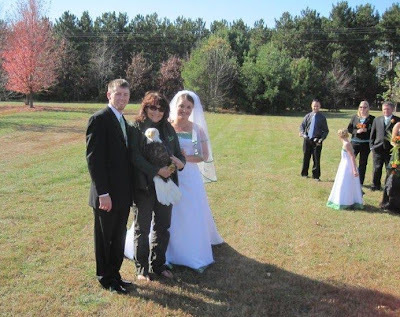 It was a beautiful outdoor wedding which was punctuated with the release of an adult Bald Eagle Click on the link to see the story. Gina and Kyle are both biologists and currently work for Alaska Fish and Game. Gina is also an Environmental Educator. We wish them the very best as they begin a life together! Anyone who knows me even a little bit understands that our interns and former employees remain part of the REGI family, and therefore ours, forever:). There have been many interns over the past 20 years. They are living and working far throughout the U.S. and world. We treasure the times we meet up with them, and share special times in their lives. We are convinced REGI people have the most beautiful weddings EVER! 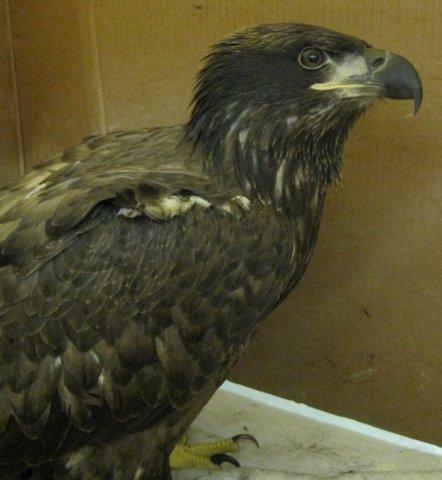 We admitted a young Bald Eagle with a traumatic wing injury this weekend. He lost a lot of blood with the injury. He is beginning to eat on his own and that is a good sign. As in most wildlife cases, we are not sure what caused the injury. It is possible the eagle was shot. Shooting an eagle is illegal, of course, but happens more than the public would believe. 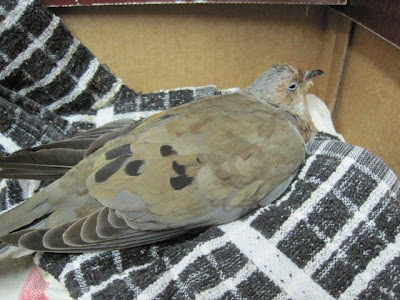 Wildife law enforcement will be involved if the injuries are the cause of illegal activity. 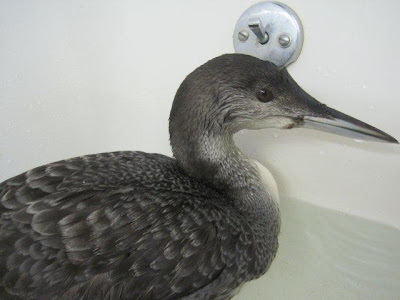 The Common Loon admitted last Sunday with fishing line and a lead sinker wrapped around her beak and tongue is making progress. She had some breathing problems through the weekend and began running a high temperature. She is now on antibiotics as well as the antifungal drugs to ward off aspergillosis. Her beak is actually indented, which may be a long term mark. Fortunately, that will not be a disability. Cedar Waxwings are winging their way to warmer climates and eating fruit left on trees on their way. The birds can get a little affected ..."drunk" from the berries and fruit as the fruit begins to ferment on the tree. The birds affected are often found on the ground looking dazed or hit windows when their judgment is impaired. We admitted just such a patient Sunday. A beautiful Cedar Waxwing spent a little too much time eating crab apples and hit a window when she was startled. She is doing great and will be released this morning. 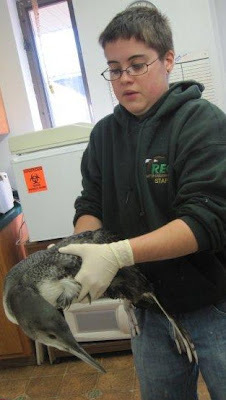 Speaking of hitting windows, we admitted a young male Goshawk on Saturday. He hit a window near Wisconsin Rapids. Many thanks to Dave and Judy Marshall for transporting the Goshawk to REGI. Goshawks are a bird of the woodlands and are not often seen. Of interest, we have admitted two young males in the past month. 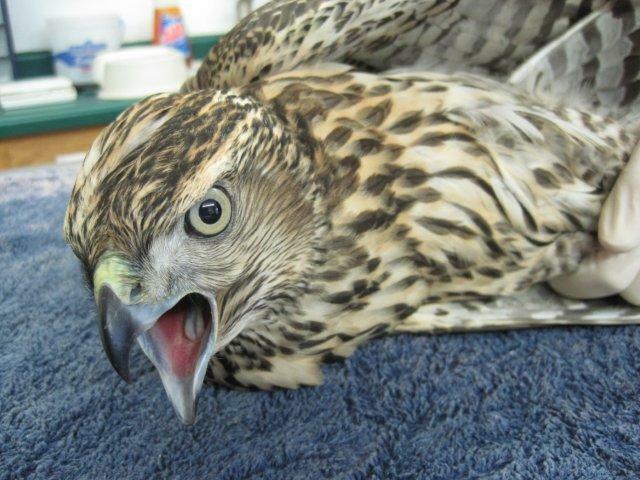 Both Goshawk patients hit windows and have head injuries. The Goshawk is a species of special concern in the State of Wisconsin. Amy and Cody Lane of Wausau, along with a friend, volunteered on Saturday. We didn't get any photos of their time here but really appreciate the help. Thanks guys! Have a great week everyone. I will be doing a presentation in La Crosse on the evening of the 20th. I will have more information on that later this week. Hi, Just passing through and felt I needed to say thanks for your work on behalf of all the Raptors and Falconers in England.